ویژگی‌های گوناگون زمین‌شناختی، ساختاری و ریخت‌شناسی در پهنه کپه‌داغ خاوری در شمال ‌خاور ایران، به شناسایی چندین زیرپهنه ریخت‌زمین‌ساختی انجامیده است که با گسل‌های بزرگ و بنیادی از هم جدا شده‌اند. 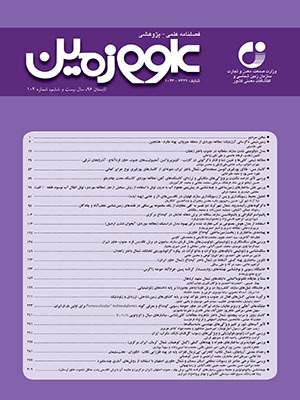 در این پژوهش بر پایه داده‌های میدانی، نیمرخ‌های بازتاب لرزه‌ای، تصاویر ماهواره‌ای و رسم برش‏های ساختاری، بخش‌های چین‌خورده در میان گسل‌های بنیادی که ویژگی‌های گوناگونی با هم دارند، به‌عنوان زیرپهنه‌های ساختاری شناسایی شده‌اند. این زیرپهنه‌ها به‌ترتیب از جنوب ‌باختر به شمال ‌خاور به‌نام «هزار مسجد»، «دره‌گز- سرخس» و «پیش‌ژرفای کپه‌داغ» نام‌گذاری و با گسل‌های کشف‌رود، مزدوران و شمال کپه‌داغ در بر گرفته شده‌اند. زیرپهنه‌های نام ‌برده از زمان ژوراسیک میانی و همزمان با آغاز گامه کششی در پهنه کپه‌داغ و روی صفحه‌ی توران پدید آمدند. گسل‌های در بر گیرنده آنها در آغاز به‌گونه گسل‌های کششی بودند که فروبوم (graben) و نیم‌فروبوم‌هایی (half grabens) را در حوضه نهشتگی ساخته بودند. بیشترین کشش و فرونشینی در زمان ژوراسیک میانی و همزمان با نهشته شدن سازند کشف‌رود رخ داد. نرخ فرونشست متفاوت و پیکربندی پدید آمده در حوضه رسوبی سبب تغییر جانبی سنگ‌رخساره و ستبرای سازند کشف‌رود در جاهای گوناگون حوضه شد. در پی آغاز بسته شدن اقیانوس تتیس ‌جوان در میان صفحه‌های ایران و عربی در زمان ائوسن پسین، گامه فشارشی در پهنه کپه‌داغ آغاز شد که سبب وارونگی زمین‌ساختی، کارکرد دوباره گسل‌های کششی کهن و تبدیل آنها به گسل‌های وارون و چین‌خوردگی نهشته‌ها شد. Different geological, structural and morphological characteristics of the eastern Kopeh-Dagh Province in NE Iran resulted in identification of several morphotectonic domains separated by major basement faults. Based on various field surveys, seismic reflection data, satellite images and cross-sections construction we introduce the fault-bounded deformed areas with different characteristics as the structural domains. These domains are the Hezar-Masjed, Darreh-Gaz- Sarakhs, and the Kopeh-Dagh foredeep from southwest to northeast, respectively. They are bounded by the Kashafrud, Mozduran, and the North Kopeh-Dagh faults. The domains were formed on the Turan plate since Middle Jurassic times when the extensional phase commenced in the Kopeh-Dagh Province. The bounding faults were initially of normal mechanism which generated grabens and half-grabens within the sedimentary basin. The maximum extension and subsidence in the basin occurred during Middle Jurassic, synchronous with the deposition of the Kashafrud Formation. Differential subsidence and configuration of the basin resulted in lateral lithofacies variations and thickness changes of the Kashafrud Formation throughout the basin. The main compression event in the Kopeh-Dagh Province started following the closure of the Neo-tethys ocean between the Iranian and Arabian plates in the Late Eocene, which caused inversion tectonics and reactivation of pre-existing normal faults as well as folding of sedimentary cover. افشارحرب، ع.، 1373- زمین‌شناسی کپه‌داغ، طرح تدوین کتاب زمین‌شناسی ایران، انتشارات سازمان زمین‌شناسی و اکتشافات معدنی کشور، شماره‌ی 11، 275 ص. شهیدی، ع.، نظری، ح. و قائمی، ف.، 1392- زمین‌ساخت ایران «کپه‌داغ». انتشارات سازمان زمین‌شناسی و اکتشافات معدنی کشور. 197 ص. مطیعی، ه.، 1374- زمین‌شناسی نفت زاگرس، طرح تدوین کتاب زمین‌شناسی ایران، انتشارات سازمان زمین‌شناسی و اکتشافات معدنی کشور، شماره‌ی 25، جلد اول، 589 ص.
Alavi, M., 1991- Sedimentary and structural characteristics of the Paleo-Tethys remnants in northeastern Iran. Geological Society of America Bulletin, 103, p. 983-992. Ambraseys, N. and Melville, C., 1982- A History of Persian Earthquakes, Cambridge University Press, New York, p. 219. Berberian, M. and King, G.C.P., 1981- Towards a paleogeography and tectonic evolution of Iran: Canadian Journal of Earth Sciences, 18, p.210-265. Berberian, M., 1995- Master blind thrust faults hidden under the Zagoros folds: active basement tectonics and surface morphotectonics. Tectonophysics, 241, p. 193–224. Brun, J. P. and Nalpas, T., 1996- Graben inversion in nature and experiments. Tectonics, Vol. 15, No. 2, p. 677-687. Eftekharnejad, J., and Behroozi, A., 1991- Geodynamic significance of recent discoveries of ophiolites and late Paleozoic rocks in NE Iran (including Kopet Dagh): Abhandlungen der Geologischen Bundesanstalt, v. 38, p. 89–100. Falcon, N., 1974- Southern Iran: Zagros mountains. In A. Spencer (Ed. ), Mesozoic- Cenozoic orogenic belts. Geological Society of London, Special Publication, 4, p. 199-211. Hollingsworth, J., 2007- Active tectonics of NEiran. Ph.D. thesis, Queen’s college, University of Cambridge, p. 239. Kavoosi, M. A., Sepehr, M. and Sherkati, S., 2009- Kopeh Dagh basin evolution during Middle-Late Jurassic.First International Petroleum Conference & Exhibition, Shiraz, Iran. Lyberis, N. and Manby, G., 1999- Oblique to orthogonal convergence across the Turan block in the Post-Miocene. American Association of Petroleum Geologists Bulletin, 83, p. 1135-1160. Motaghi, K., Tatar, M., Shomali, Z. H., Kaviani, A. and Priestley, K., 2012- High resolution image of uppermost mantle beneath NE Iran continental collision zone. Physics of the Earth and Planetary Interiors 208–209 , p. 38–49. Robert, A. M. M., Letouzey, J., Kavoosi, M. A., Sherkati, S., Müller, C., Vergés, J. and Aghababei,A., 2014- Structural evolution of the Kopeh Dagh fold-and-thrust-belt (NE Iran) and interactions with the South Caspian Sea Basin and Amu Darya Basin. Marine and Petroleum Geology 57, p. 68-87. Ruttner, A., 1991- The Triassic of Aghdarband (AgDarband), NE-Iran, and its pre-Triassic frame. In: Abhandlungen der Geologischen Bundesanstalt, vol. 38, p.252. Sheikholeslami, M. R. and Kouhpeyma, M., 2012- Structural analysis and tectonic evolution of the eastern Binalud Mountains, NE Iran. Journal of Geodynamics, 61, p. 23-46. Sherkati, S. and Letouzey, J., 2004- Variation of structural style and basin evolution in the central Zagros (Izeh zone and Dezful Embayment), Iran. Marine and Petroleum Geology, 21, p. 535–554. Stocklin, J., 1968- Structural history and tectonics of Iran, a review. AAPG Bull., v.52, No.7, p. 1229-1258. Taheri, J., Fürsich, F. T. and Wilmsen, M., 2009- Stratigraphy, depositional environments and geodynamic significance of the Upper Bajocian-Bathonian Kashafrud Formation, NE Iran.Geological Society, London,Special Publications 312, p. 175-188. Thierry, J., 2000- Middle Callovian (157–155 Ma). In: Dercourt, J., Gaetani, M. etal. (eds) Atlas Peri-Tethys Palaeogeographical Maps. CCGM/ CGMW, Paris, p. 71–97. Thomas, J., Cobbold, P., Shein, V. and Douaran, S. L., 1999- Sedimentary record of Late Paleozoic to recent tectonism in Central Asia–analysis of subsurface data from the Turan and South Kazak domains. Tectonophysics 313, p. 243–263. Trifonov, V., 1978- Late Quaternary Tectonic Movement of Western and Central Asia. Geological Society of America Bulletin, 89, p. 1059–1072. Zanchetta, S., Berra, F., Zanchi, A., Bergomi, M., Caridroit, M., Nicora, M. and Heidarzadeh, G., 2013- The record of the Late Palaeozoic active margin of the Palaeotethys in NE Iran: Constraints on the Cimmerian orogeny. Gondwana Research 24, p. 1237-1266. Zanchi, A., Zanchetta, S., Balini, M. and Ghassemi, M. R., 2015- Oblique convergence during the Cimmerian collision: evidencefrom theTriassic Aghdarband basin, NE Iran, Gondwana Research, doi:10.1016/j.gr.2015.11.008.